I'm off today on my annual trip to the Glimmerglass Opera Festival in Cooperstown, NY. Their policy under the new directorship of Francesca Zambello is to devote one of the four annual productions to a classic American Musical Comedy performed in the original keys, with the original orchestration but WITHOUT amplification of any kind. This year it is Meredith Wilson's The Music Man. The operas are Verdi's hardy perennial Aida and Lulli's Armide along with Kurt Weill's Lost in the Stars, a famous musical play on the evils of Apartheid during the time of its formulation in South Africa. Weill's music requires operatic voices. Another Zambello innovation, the resident big star who spends the summer in a wide variety of activities at the Festival, this year has brought the sensational baritone Eric Owens to Cooperstown. Owens will sing the lead in Lost in the Stars as well as Amonasro in Aida. On Saturday morning, I'll head out to see what's left of the great antique barns that used to be among the best I'd seen anywhere but which were closing rapidly last year, unable to survive the under 30-somethings' preference for Ikea to great furniture from the past. Along the way, there'll be a stop at the Ommegang Brewery for a couple of cases of their magnificent Belgian-style beer (secondary fermentation in the bottle as with champagne). Glimmerglass has announced its offerings for 2013 already -- resident artist next season will be heartthrob baritone Nathan Gunn who will sing Launcelot in Lerner & Loewe's Camelot. There will also be Wagner's The Flying Dutchman, Verdi's early-career Un Giorno di Regno, and a rather odd double bill called Passions consisting of the 2008 Pulitzer Prize-winning opera, The Little Match Girl Passion and, from the 18th century, Pergolesi's Stabat Mater, a religious cantata which may or may not be staged -- I can't tell from the publicity. With thanks to George Takei, "How things went afowl between good friends"
The opera festival sounds good to me (and that's saying a lot). Have a great time! I'm sure you'll be hitting the Baseball Hall of Fame while you're there! Been there, done that, Mitchell. I've been coming here for 20 summers now and have covered most of the area's attractions. Good luck with Lost in the Stars. No semi-staged performance I've seen - that's to say two, and one concert performance - has made it work. And I love Weill! David, it was a virtually perfect production, done very simply but with the major reationships made quite visceral. Eric Owens was tremendous as Stephen Kumalo. It is a great relief to hear from you again after a couple of month of unaccustomed silence on the blog. Have a wonderful time in Cooperstown! I miss going to Glimmerglass ever since I moved to Oregon. Some summer my partner David and I have to get to the festival! 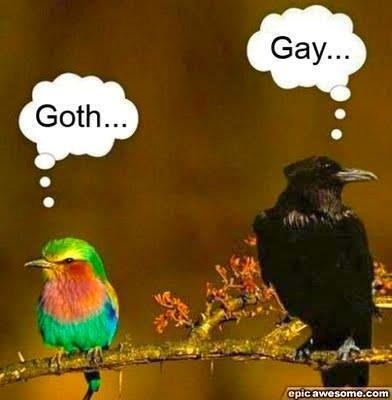 The goth/gay birds picture made me laugh. But I'm low-brow like that. I sent this post to a friend who has attended Glimmerglass a few times, but could not make it this year. He said reading your account was almost as good as going!